Ellen DeGeneres, a savvy, congenial performer best known as a joker/dancer/talker, has signed to replace Paula Abdul as American Idol's fourth judge of singing talent. Fox made the surprise announcement Wednesday night, with Idol executive producer Simon Fuller praising DeGeneres as a longtime fan of the show whose "love of music and understanding of the American public will bring a unique human touch to our judging panel." DeGeneres, in the seventh season of her successful daytime talk show, will join Idol's ninth season after the audition rounds, Fox said. Holding her chair until then will be a variety of guest judges, ranging from Neil Patrick Harris to Victoria Beckham. "I've watched since the beginning, and I've always been a huge fan," DeGeneres says. "So getting this job is a dream come true, and think of all the money I'll save from not having to text in my vote." Abdul recently quit Idol over a salary dispute after being a judge since the show's 2002 premiere. The door seemed slightly ajar had she reconsidered. But she's now unequivocally a part of the show's history. DeGeneres, who will remain with her talk show, joins judges Simon Cowell, Randy Jackson and Kara DioGuardi, who was added last season. A three-page Fox publicity release omits any mention of Abdul, but makes it clear that DeGeneres, 51, will be taking on something of a humanitarian role in her absence. "Beyond her incredible sense of humor and love of music, she brings with her an immense warmth and compassion that is almost palpable," gushed co-executive producer Cecile Frot-Coutaz. It does seem like an inspired choice. 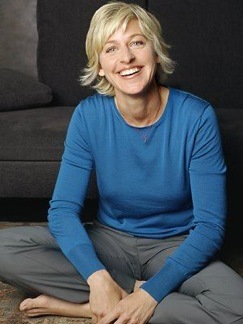 The openly gay DeGeneres has evolved from a controversial figure to one of America's sweethearts. Her August 2008 marriage to actress Portia de Rossi caused nary a ripple. And her latter day career has brought her multiple Emmy Awards, high-profile product endorsements and accolades as host of both the Oscars and the Emmys. Abdul suddenly seems to represent the very distant past. It didn't take long, did it? Only one open question remains. Is four judges still too much? If so, DioGuardi remains thoroughly expendable.